The State of Vermont has again been awarded the top U.S. Domicile for “Vermont’s inability to stand still and its continued desire to lead the captive industry.” This is the fourth year that the State of Vermont has been honored with this award, which was presented by Captive Review Magazine during the U.S. Captive Services Awards held on August 8 in Burlington, Vermont. 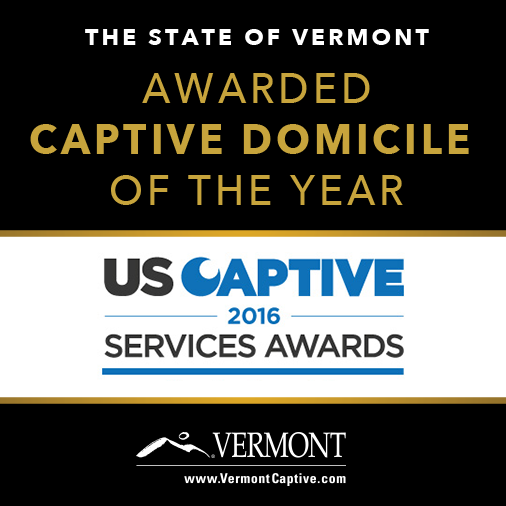 Vermont Wins Top U.S. Domicile for Captive Insurance for the 4th time. 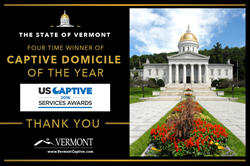 Our captive professionals in Vermont are the best in the business and this award is not only a reflection of them, but also of the quality companies that choose to domicile in Vermont. “Our captive professionals in Vermont are the best in the business and this award is not only a reflection of them, but also of the quality companies that choose to domicile in Vermont,” said Vermont Governor Peter Shumlin. The State of Vermont continues to lead the captive insurance industry in the number of Risk Retention Groups (RRG). Vermont’s RRG’s make up over 60% of all RRG gross premium written, more than five times the next largest domicile. Overall gross written premium for all of Vermont’s captives exceeded $27.6 billion. Vermont has continued to improve upon its industry leading legislation. This year was no exception, with new captive insurance legislation being passed in the 2016 session to strengthen a variety of areas including; refining governance standards, expanding dormancy and allowing for cells to be transferred, sold, assigned or converted to stand alone captives without affecting the rights or obligations of the cell. Vermont is off to a strong start to captive licenses in 2016 with 11 new captives. The newly licensed captives include six Pure, three Risk Retention Groups, and two Special Purpose Financial Insurers. Four of the new captives are in manufacturing, two are in the healthcare sector and two are in the insurance sector. 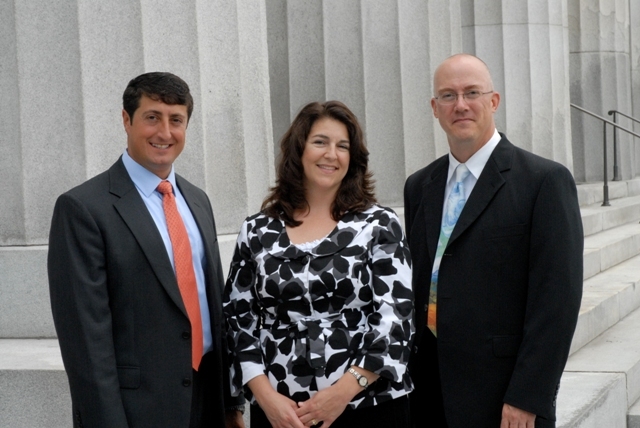 Captive insurance is a regulated form of self insurance that has existed since the 1960’s, and has been a part of the Vermont insurance industry since 1981, when Vermont passed the Special Insurer Act. Captive insurance companies are formed by companies or groups of companies as a form of alternative insurance to better manage their own risk. Captives are typically used for corporate lines of insurance such as property, general liability, products liability, or professional liability. Growth sectors of the captive insurance industry include professional medical malpractice coverage for doctors and hospitals, and the continued trend of small and mid-sized companies forming captive insurance companies.